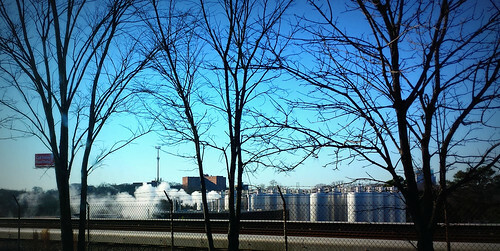 On a winter's afternoon, steam billows outside, from the kettle inside, at Sweetwater Brewing, in Atlanta, Georgia. As seen from the highway, I-85, on 4 January 2016. I wasn't driving. Reviewing beer? Avoid "high and mighty snobbery." Today, a second in an infrequent (ex post facto?) series on reviewing beer. The first installment was from historian Maureen Ogle: a humorous essay on enlivening a review by bringing in personal experience. Today, it's advice from the BJCP newsletter, on how to avoid "high and mighty snobbery." 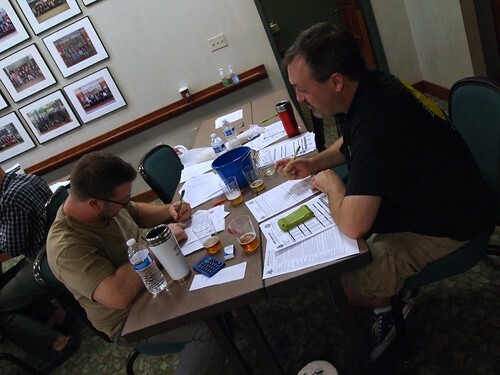 The BJCP —Beer Judge Certification Program— trains and certifies judges for homebrew and professional beer competitions. It's a non-profit organization, founded in 1985, "to promote beer literacy and the appreciation of real beer, and to recognize beer tasting and evaluation skills." 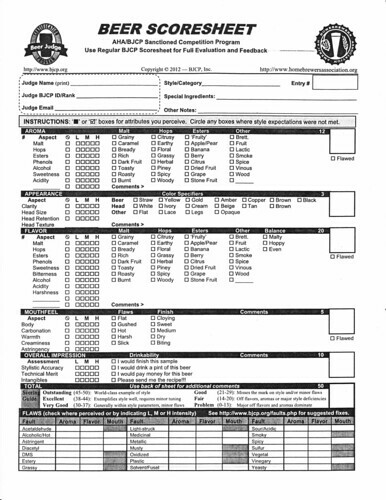 At every competition we judge, we are told to ensure that entrants are receiving quality feedback and scoresheets. [...] While it is the duty of each judge to write a proper scoresheet, remember that it is an even worse error to only write a few comments, which is seen from time to time. [...] As the day gets long and judges become complacent, it can begin to creep into sections of a beer’s evaluation by judges of all levels. One of the easiest way to combat this, and give interested stewards a chance to enhance their judging skills, is a simple discussion. Naturally, this happens at varying levels after every beer, but if you see scoresheets beginning to suffer, take it a step further. All initial notes have been made at this point, but taste the beer again and together highlight the basic aspects of the beer that are listed in each section of the scoresheet. Alternate and discuss. For instance, in the Aroma section, begin simply by discussing the malt character. What you notice, the intensity, the specific characteristics. Take that next into how it plays with the hop character of the beer. Move to the yeast, and anything else that stands out. Both positive and negative. Just remember to stress how it comes to play versus the style guidelines. If you haven’t taken the time to review the guidelines together, pull them out now and take the opportunity to do it. While this may cause the evaluation of a couple beers to take a bit longer, you will have a refreshed understanding of what the beer should be and what is expected on the scoresheet. This should also help the later beers in the flight move faster, as now there is a greater understanding of the beers being presented to you. While this may sound like a cliche, and may not be completely possible in every situation, invoking memories about the beer and translating those memories helps to build a better scoresheet. 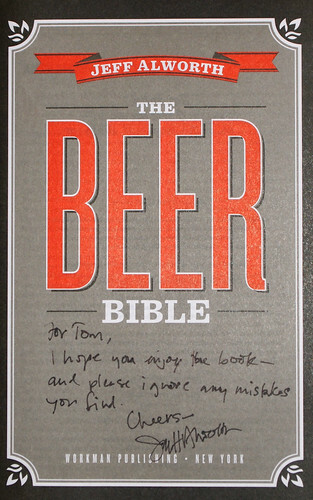 Even if the only memory you can recall is that of another beer or brewery, write that down. While it may be a tricky area saying something such as, “This beer is reminiscent of an -insert brewery name- product”, it shows at a minimum the beer is of commercial grade. Specific memories typically mean nothing to another person. For instance, how many people out there have tasted your grandma’s homemade rhubarb pie? But in general terms, everyone should at least have an idea of basic concepts even if they have never experienced salt water taffy, charleston chews, or chocolate covered cherries. Getting judges and stewards to reach and expand their thought process while drinking a beer leads to better understanding. This can be a difficult section, and sometimes judges struggle with what to include here. Begin by giving your basic thoughts on the beer in regard to the entered style. Also, if the beer is a good example of a style, but not the style entered, be sure to not only say it is miscategorized but where it should go. There are times when entrants received this feedback but they were not told why the beer was out of style or where it should go instead. After that you can move into talking about how the beer missed the mark in sections where it was either not previously discussed or where the “major” issue lies. 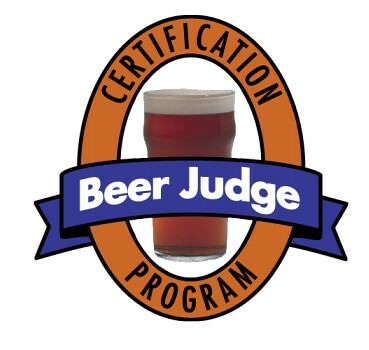 Ask the judge you are working with to contrast the characteristics of the beer with the guidelines. While working on those areas, also consider the balance of the beer. The bitterness of a beer can be right for the style but paired with the body or yeast character, there may be a struggle for power. Comments in this vein will give more experienced homebrewers ideas to think about rather than what some see as “high and mighty snobbery” and will give the less experienced homebrewers an idea of what the score they received actually means in regards to their beer. Clamps & Gaskets: News Roundup for Weeks 1/2, 2016. A date in U.S. history that should live in ignominy. 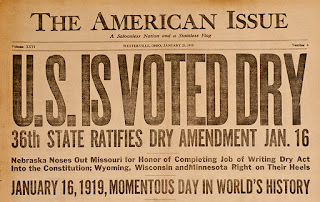 National Prohibition, the 18th Amendment to the United States Constitution, was passed on 16 January 1919, and took effect a year and a day later, on 17 January 1920. It would not be repealed until 5 December 1933, with the passage of the superseding 21st Amendment. Iran frees Washington Post correspondent Jason Rezaian, 3 others. President Obama declares State of Emergency over lead in Flint, Michigan, drinking water. Wikipedia, the Internet’s “free encyclopedia,” first went 'live,' 15 years ago, 15 January 2001. On January 15 , Wikipedia officially celebrates 15 years as the Internet’s “free encyclopedia,” cataloging humankind’s achievements in real time. In that time, it has hastened the end of Microsoft’s Encarta encyclopedia and supplanted Britannica as the dominant reference work in English. While the digital landscape has changed drastically over the last decade, Wikipedia has not, and still delivers that rare site that strives for neutrality and accuracy, all with no commercial advertisements. The hoaxes that appear on Wikipedia, and the volunteers who search for them. 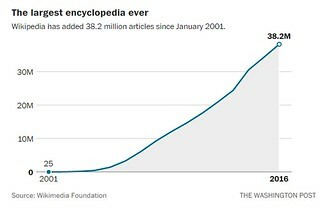 A 2005 study in the journal Nature found that the information provided on Wikipedia is almost as reliable as that of the benchmark, Encyclopedia Britannica. The photographic-historical resource, Flickr Commons was begun eight years ago, 15 January 2008, as a collaboration with the Library of Congress. In 2016, over 100 public and private institutions are partners with Flickr Commons (including the U.S. National archives and the U.K. British Museum). All have released significant portions of their photographic libraires online, into the public domain. 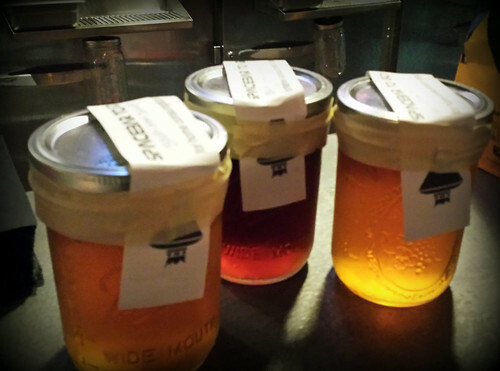 The 'next' 'craft' beer takeover? UnTappd sold to NextGlass; "to continue just as we have." Untappd surpassed the 1,000,000 users mark in early 2014. Founded more than five years ago, Untappd lets beer lovers share the beers they are drinking with others, also letting them include photos, location, ratings and descriptions of the beers. It has grown to nearly 3 million users. Next Glass, which launched in November 2014, lets you scan possible wine and beer purchases with your portable device and then gives you a rating and other information about what's in the bottle. "I will count to three. There will not be a four." British stage and film actor Alan Rickman, known for his roles in the Harry Potter movies and Die Hard, has died, of cancer, at 69. AB InBev sells $55 billion in bonds to finance its more than $100 billion purchase of SABMiller, the second-largest bond sale on record. The American Malting Barley Association has announced its year 2016 recommendations for malting barley varieties. The AMBA recommends that farmers on the East Coast switch from Pinnacle, a low-protein variety, to a new variety, ND Genesis, also low in protein, but with better foliar disease resistance and higher yields. 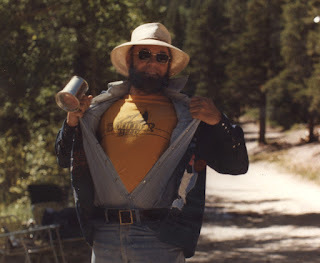 Bert Grant and the day in 1984 when he first created "American Imperial Stout." 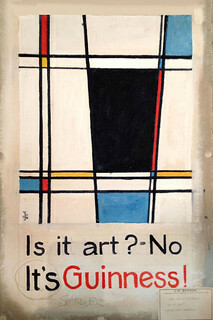 —Via Charlie Papazian at The Examiner. British beer historian Martyn Cornell responds to the new drinking guidelines issued by the U.K. Chief Medical Officer: "Pleasure versus risk, the honest alcohol debate. In the health-and-drink debate, pleasures of drinking are seldom discussed, and never calculated." Singer, songwriter, actor David Bowie, "the infinitely changeable, fiercely forward-looking songwriter who taught generations of musicians about the power of drama, images and personas," has died at 69. 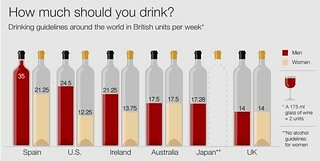 The Chief Medical Officer of the United Kingdom has announced new guidelines on alcohol and drinking: oth men and women should regularly drink no more than 14 units of alcohol per week, the equivalent of six small glasses of wine or five pints of beer at 5% ABV strength. Pregnant women should not drink at all. Guidelines in the U.S. recommend that women should not exceed one standard drink per day and men should no more than two. That equates to 12 units a week for women and just over 24 for men. The new UK advice also suggests that there is no safe level of drinking -- and any amount of alcohol can increase the risk of cancer, according to new research. The eleven oldest operating breweries in the United States. U.S. government revises its "Dietary Guidelines for Americans;" releases 8th edition, for 2015-2020. When determining the number of drink-equivalents in an alcoholic beverage, the variability in alcohol content and portion size must be considered together. As an example, the amount of alcohol in a beer may be higher than 5 percent and, thus, 12 ounces would be greater than one drink-equivalent. In addition to the alcohol content, the portion size may be many times larger than the reference beverage." California declares a State Of Emergency over a leak at a natural gas well ouside of Los Angeles releasing 1,200 tons of methane daily. 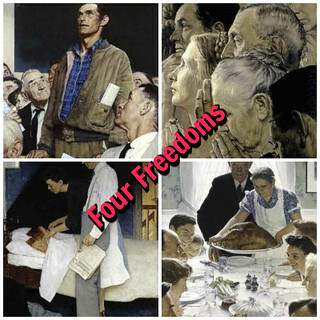 Seventy-five years ago, on 6 January 1941, President Franklin Roosevelt spoke on the fundamental values of American democracy, with “four essential human freedoms” at its core: freedom of speech and expression, freedom of worship, freedom from want, and freedom from fear. Pianist Paul Bley has died at age 83. Bley, a key figure in modern jazz for six decades, worked early in his career with jazz masters Charlie Parker and Lester Young before becoming a champion of electronic music and an inspiration to younger musicians, including pianist Keith Jarrett and guitarist Bill Frisell. Pierre Boulez, the French composer and conductor who was a dominant figure in classical music for over half a century, has died at age 90. Robert Stigwood, the impresario who managed the Bee Gees and produced the 1970s blockbusters “Grease” and “Saturday Night Fever,” has died at age 81. —Via Washington Post. What is a modern bottled 'mild ale'? First, it has to put sweet malt and flavours from sugar at the forefront, but that doesn’t have to mean that it has to be sickly or lacking in character. Bitterness can work, but excessive perfume just seems wrong. Roastiness also jars, suggesting that some brewers remain in thrall to out-of-date history that declares mild to be a degeneration of porter, which it isn’t. Fun with numbers. Nielsen, a global information and measurement company, says the rate of 'craft' beer growth slowed in the latest 4 week period reported (through 19 December), up only 4.3%, half the 8.7% annual pace. [U.S.] Brewers Association disagrees with metrics; says the rate of grwoth is up. —Via Beer Marketer's Insights. One-pint mason jar filled from draught beer taps, and sealed. Sixteen-ounce growlers-to-go. Clamps & Gaskets: News Roundup for Weeks 52/53, 2015. 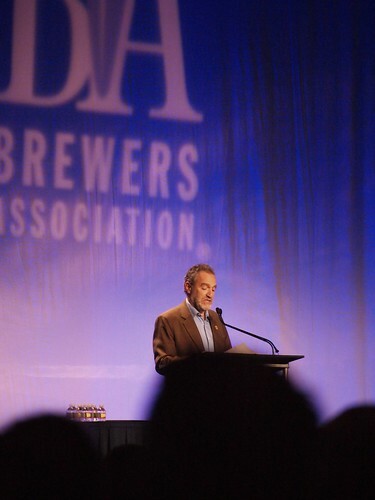 'Craft' beer pioneer Charlie Papazian —founder of the American Homebrewers Association, the Association of Brewers (predecessor of Brewers Association), and the Great American Beer Festival; author of the seminal (Complete) Joy of Homebrewing; founding publisher of the magazines Zymurgy and The New Brewer— to retire. "I really didn't say everything I said.” A few notable deaths of 2015. Liberal standard-bearer newspaper, Washington Post, fires its longtime labor and democratic-socialist columnist, Harold Meyerson, without explanation. Eight ways wine will change in 2016, including the growth of English sparkling wine and the mainstreaming of 'natural' wine. "A new generation of ['craft' beer] drinkers is being taught to appreciate bad beer." Lemmy Kilmister, founding member and frontman of band Motörhead, has died at age 70, from virulent form of cancer. Motörhead's ferocious hard-rock style rejuvenated the metal genre in the late 1970s and inspired everyone from Metallica and Guns N’ Roses to Dave Grohl. Winter beers are more than a marketing whim. Barley sown in winter and harvested early the following September needs about six weeks of "dormancy" and up to 10 days of steeping, germinating and drying to become malt. 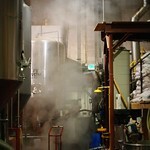 Brewing can then begin in late October, and the beer will be mature in November for drinking in December. The timetable, which dates to the days of the farmer-brewers, remains much the same today. Most winter beers are accented towards the sweet, sustaining malt - rather than the dry, appetising hop - usually with a good belt of alcohol to create at least the pleasant illusion of warmth. —Via Michael Jackson: The Independent, 1992 (Online at Beer Hunter). A very Beatles Christmas. It has released its entire catalog for streaming. When we look back over the history of American brewing, 2015 may well be remembered as the year “craft” died. 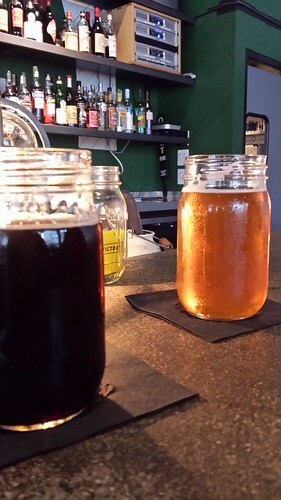 Not the craft segment, with flavorful IPAs, pilsners, and wild ales, but the very idea of a small, independent craft brewery making these beers in contrast to large, faceless multinationals that make only mass market lagers. Spain's Mahou-San Miguel Brewing Company is considering buying a stake in venerable U.S. 'craft' brewery Anchor. Anheuser-Busch InBev is making its third craft brewery purchase in the last five days, today announcing the acquisition of Colorado’s Breckenridge Brewery [70,000 barrels in 2015]. The news comes just one day after the company acquired London’s Camden Town Brewery, and four days after it said it would buy Arizona’s Four Peaks Brewing. In August, A-B announced the purchase four wholesalers in Colorado and an A-B wholesaler based in Odessa, Texas. The confusing (and forlorn) saga of brewery taproom beer sales in Georgia. The menu-nutrition ruling for restaurants of the FDA (Federal Drug Administration) will not create onerous requirements upon 'craft' breweries. If the specific type of wine, beer or distilled spirit offered for sale in your establishment matches the description of the types of beverages that were used to determine the caloric or other nutrient content in the USDA database, then the nutrition information from the USDA database can be used. [U.S.] Brewers Association announces that it is "pleased" with end-of-year tax breaks and regulatory relief for 'craft' breweries. Congress has passed favorable tax reforms that will significantly benefit small brewers. Additionally, the Alcohol and Tobacco Tax & Trade Bureau (TTB) updated and expanded the formula rule, providing long-sought-after exemptions for the industry. The tax extenders package for small beverage alcohol producers includes favorable reforms related to bond requirements and extended filing periods. The plan makes the tax cuts for equipment permanent, while also significantly raising the qualifying threshold. Additionally, the bill includes language that would keep any of the funds made available by this or any other act to be used to implement or enforce any provision of the FDA Food Safety Modernization Act. The American Craft Spirits Association (ACSA) is “disappointed” at the decision not to include a federal tax excise (FET) reduction in a new bill passed by the U.S. Congress. the trade body has worked to help craft distillers by campaigning for a reduction in FET, which currently comprises 54% of the cost of a typical spirit product. The ACSA argued craft spirits producers are in fact at a greater disadvantage to craft brewers and wineries, which receive “significant” reductions in their FET rate, meaning craft spirits producers pay 5.4 times more than craft breweries and 16.4 times more than small wineries. 96% of today's 4,100 U.S breweries make fewer than 15,000 barrels of beer per year. —Via Julia Herz (of [U.S.] Brewers Association. Nearly three hundred pints (37.5 gallons) of water are required to make one pint of beer ... for the cultivation of barley alone (and thus excluding the water footprint of hops). —Via Water Footprint Network. More than 2,000 U.S. cities contain a brewery within their limits; nearly 1,000 U.S. cities, with populations greater than 10,000, do not. —Via [U.S.] Brewers Association. How early 20th-century Guinness brewer William S. Gosset created the concepts of statistical significance and industrial quality control. Kurt Masur, the music director emeritus of the New York Philharmonic, who was credited with transforming the orchestra [as music director from 1991 to 2002] from a sullen, lackluster ensemble into one of luminous renown, died on Saturday in Greenwich, Connecticut, from complications of Parkinson’s disease. He was 88. David Hummer, the astrophysicist who co-founded the Boulder Beer Company in 1979, pioneering the then-novel idea that a 'craft' brewery could succeed commercially, has died at the age of 81. A date in U.S. history that should live in ignominy. Our religion is based on freedom of choice. It is for us to decide choices bad or good, according to our definition of the same. Men and women cannot be legislated into Goodness nor into Salvation. If we lose control of ourselves, the mind and body run riot. Self-control, combined with temperance in the individual, is the basis of society's moral success. Prohibition begins at the wrong end. 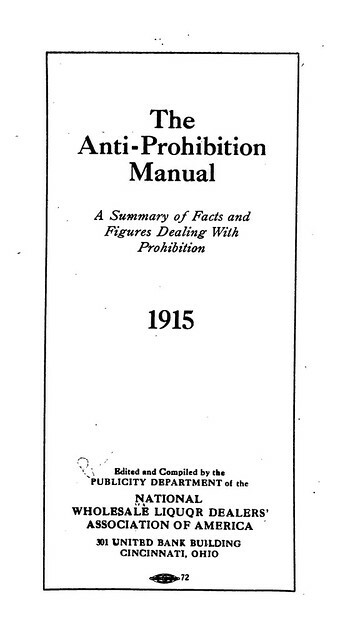 The Prohibitionist believes — “Law, then public sentiment”— whether or so. This is far from the idea of those who fought for us in 1776. Despite their efforts, the National Wholesale Liquor Dealers' Association of America would prevail against neither "Goodness nor Salvation." National Prohibition, the 18th Amendment to the United States Constitution, was passed on 16 January 1919, and took effect a year and a day later, on 17 January 1920. Decreeing alcolic beverages to be illegal nationwide*, the 18th Amendment has the ignominious distinction of being the only Constitutional amendment, among all twenty-seven approved, to deny rights rather than granting them. Prohibition would remain in effect for thirteen years, not repealed until 5 December 1933, with the passage of the superseding 21st Amendment. How dry I am, how dry I am. It's plain to see just why I am. And that is why so dry I am. 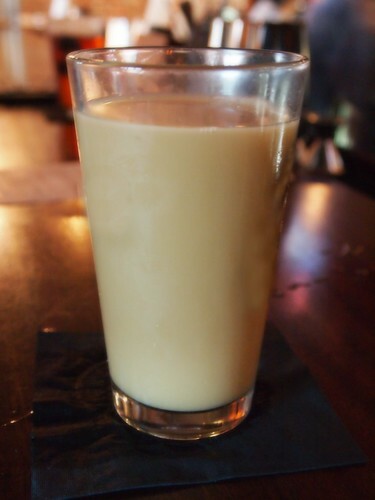 Have a drink of Bevo. It's the grandest imitation that we know. If you care for beer, it's the drink you should pick. It tastes like lager but it hasn't got the kick. Though it hasn't got a punch up, it's sleeve-o. Oh, how I call for alcohol. —Robert Frost, “Stopping by Woods on a Snowy Evening,” 1923. 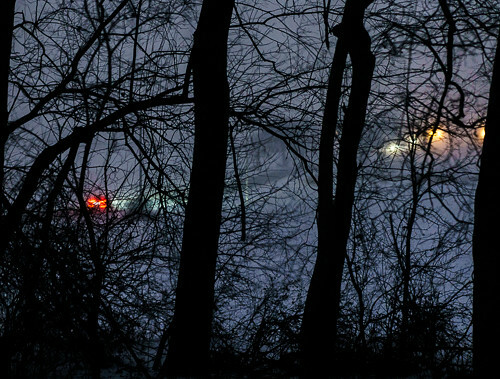 Photo, outside of Madison, Wisconsin, on a snowy evening, 28 December 2015. #VeggieDag Thursday: Beer & Cheese Soup. Cheddar/Stilton Beer Soup might be vegetarian, but it is not, of course, vegan, and it is not, of course, low-calorie. Use good-tasting beer.1 Unlike other beer-in-food-recipes, with this, the beer's flavor will be evident. Likewise, please use good cheese; it's the soup's primary ingredient.2 I've adapted the recipe from The Kitchn website. It should make enough soup to serve five or six. And, it all starts with a roux. 1) In a large pan, sautée the onions, carrots, and celery with one tablespoon of olive oil over medium to medium-low heat until soft and translucent, about 8 minutes. Add the garlic and cook for another minute. 2) In a Dutch oven or heavy-bottomed soup pot, make a roux. Heat 3 tablespoons olive oil or butter over medium heat. Slowly add 3 tablespoons flour. Stir or whisk the flour constantly for about 5-7 minutes, lightly-toasting it. The roux adds depth of flavor and prevents the cheese from separating (or becoming stringy) once added. 3) In the soup pot, whisk the vegetable stock into the roux. Add the sautéed vegetables and bay leaves, mix in the nutmeg, and bring to a gentle boil. Reduce heat and simmer, stirring occasionally, for 45 minutes. 4) Remove bay leaves! Blend soup with immersion blender. 5) Return to a gentle simmer over medium-low heat. Add a few ounces of beer and whisk. Add a small chunk of cream cheese and whisk. Add a handful of the blue cheese and cheddar, and whisk. Repeat, whisking constantly, until the cheeses have melted. Don't boil! 6) Stir in the milk, mustard, and Worcestershire sauce, and gently simmer. Season with pepper to taste. (Only add salt if needed.) If the soup is too thick, add more milk and/or stock and/or beer as needed. 7) Serve immediately. Ladle into bowls. 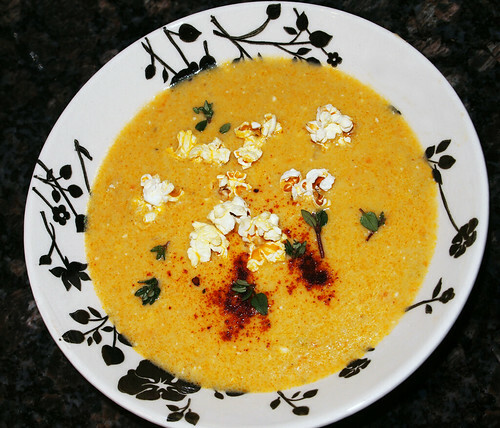 Garnish each with a few popped kernels of popcorn, a dash of smoked paprika, and a few shreds of sage. For a smoother consistency, follow steps 1 through 4, but then strain out the vegetables and bay leaves, return to the pot and continue with step 5 (even though, as this is beer-cheese soiup, why?). To make the soup in advance, follow steps 1 though 4, cooking the vegetables, making the roux, and simmering the stock and blending. Do NOT add cheese. Refrigerate. When ready to finish, bring to a simmer, and then add the cheese and follow the remaining steps. 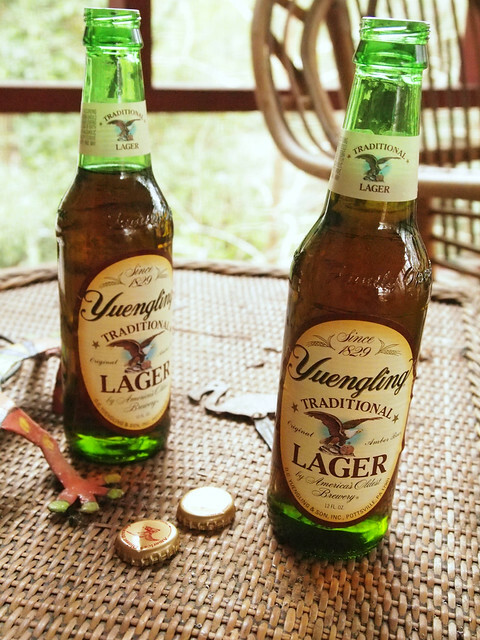 1 For the lager, choose a flavorful Dortmunder-style like Great Lakes Brewing Dortmunder Gold or an amber lager such as Yuengling, or, more flavorfully, Anchor Steam. Avoid anything overtly hoppy or overly bitter. When cooked, hops can become unpleasantly astringent. 2 For the cheeses, go artisinal. For cheddar, try an aged Cheddar from Grafton, in Vermont, for example. Or classic, from Keen's, in the UK. For Stilton, Stilton, of course. Or a good American blue, such as classic Maytag Blue. 3 Worcestershire sauce, although fermented from barley malt, also contains anchovies. There are non-fish, vegan versions. Or make your own. Do NOT boil the soup. Boiling will cause the cheese to separate. The soup is best served immediately. If any is left over, refrigerate and use the following day, re-heated, as a dip. Pic(k) of the Week: Beer, Hand, and Questions. Five years ago, when someone said 'Washington, D.C. beer', what they meant —with only a few exceptions— was beer enjoyed in the city brought into it from elsewhere. 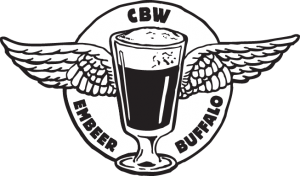 On an October evening in 2011, local beer reporter, Tammy Tuck invited several area brewers, publicans, and writers to a local pub, The Bier Baron, to discuss that situation, the state of the Brewnion, the local beer scene in the city. 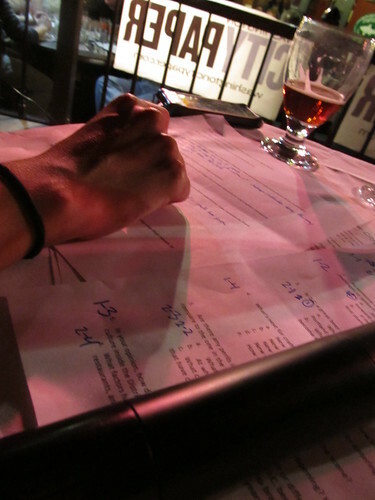 Pictured above are her hand, her beer, and her questions and notes for the evening. At the time, the D.C. 'beer scene' was already vibrant but the local, home-grown options remained few. Brewery restaurant District Chophouse, of the national Rock Bottom group, had opened in dowtown D.C. in 1997. Gordon Biersch, another national chain of brewpubs, was open and brewing in the city. And there was a brand-new production-only brewery in Washington, D.C. DC Brau had shipped its first kegs of beer in April 2011, becoming the first production-only brewery to operate in the nation's capital since 1956. The venue itself was unique in Washington, D.C. beer history. Until 2010, it had been known as the Brickskeller, which for over fifty years had been nationally renowned as a good beer destination (its beer menu included over one-thousand choices), and a beer tasting venue with national and international brewmasters, when for years there had been few to host such. In the five years following that conference, eight more breweries have opened in Washington, D.C., making for eleven in all, five of which are production-only breweries. None of the 'pundits' gathered that night in October 2011 knew that all of this was to be, but we were bullish. I was one of Ms. Tuck's invitees. I drank, I talked, and I took this photo. The U.S. economy finished the year with a red-hot hiring spree, adding 292,000 new jobs as the unemployment rate held steady at 5 percent, according to new government data released Friday morning. In all, the nation added 2.65 million jobs in 2015, the second-best year for hiring since 1999 and one that improved markedly in the last quarter. The economy added an average of 284,000 new monthly positions between October and December; in the first three-quarters of the year, the monthly pace was 200,000. Keeping that in mind, let's look at a few 'craft' brewery numbers from 1995 forward. From 2000 to 2005, the number of 'craft breweries decreased, from 1,566 to 1,447, this despite increasing employment numbers. This slowdown —which the Wall Street Journal infamously decreed as the sign of the demise of the microbrew' fad— actually had begun a few years earlier, when the rate of 'craft' brewery growth fell from 58% in 1995 to only 2% in 1997. A 'dilettante' investor boom in 'craft' beer fizzled as a lot of poorly made beer made it to shelf and bartop. Modest brewery growth returned in 2006, with an uptick from 1,460 breweries that year to 1,813 in 2010, accounting for 9,951,956 barrels of beer produced in the U.S. 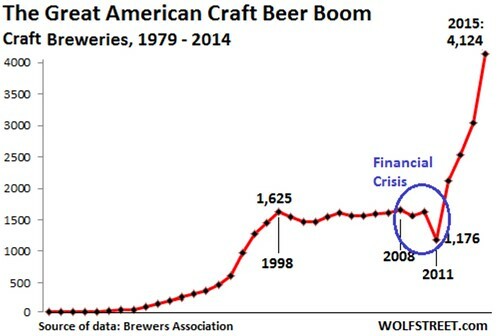 The next year, in 2011, the same year that unemployment began to decrease as the aftereffects of the Great Recession were waning, the Great 'Craft' Beer Explosion began in earnest. 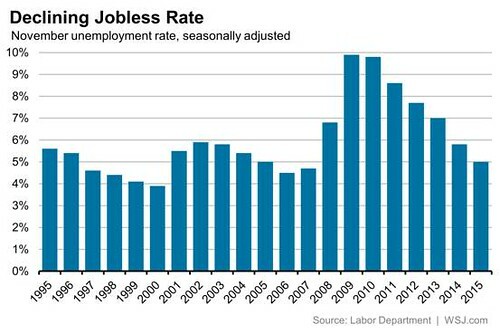 Since 2011, the national unemployment rate has decreased from 8.5% to 5%. At the same time, the number of breweries —most of which are 'craft' (producing fewer than 6 million barrels of beer per year)— has increased by 252%, from a count of 2,033 to more than 4,144 in 2015, a record number for U.S. breweries (surpassing the previous historic high of 4,131, set in 1873) and certain to be itself surpassed in 2016. Economists place the timeline of the Great Recession over nineteen months, from December 2007 through June 2009. 'Craft' breweries have proliferated since its end. Coincidence? Pic(k) of the Week: Naujųjų metų! 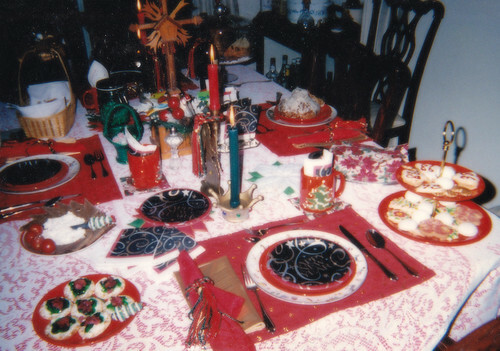 My mother's table, set for New Year's Eve, circa 2008. The topic I want you all to write about: “Are breweries your friends?” To be in business nowadays you pretty much have to have a social media presence. This is especially true in the beer world, where some breweries have basically built themselves on their personality. And yet, at the end of the day, we’re also selling you something. I believe this is the first Session to be hosted by a brewery rather than beer blogger. How do you feel about that? Do you want your feeds clear of businesses, or do you like when a brewery engages with people? Can you think of anyone who does it particularly well, or poorly? What an excellent set of questions. They ask us to look in the mirror a bit and think about how beer affects relationships but they also ask us to consider the meaning of friendship. I am a lucky guy. I have friends. Friends are people who you have known a long time, have been with you through good times and bad, folk who you can rely on without any thought of doing something in return. When they let you down the relationship is not undermined. Friends are rare. See, beer is joy juice. Makes you happy. Makes you think you are a better dancer, that your joke is funnier than it is. Makes you set aside the rules once in a while. I once knew a couple that only seemed to get along when drinking. The solvent, as I quipped, was the bond. Like any thought altering drug, alcohol can make you think you are engaged in a friendship when you really aren't. "Good times, good friends, great beer" is the promise. How much more the risk when the beer is free and the friend is the brewer? Careful relationship management is required to walk safely though that potential minefield. Are brewers my friends because I follow them on social media? Not a chance. They are not even my acquaintances. Doesn't mean they are not worth respect and attention. But in this business, that's just business. Friends are rare. Worth more than just respect and attention. What is the nature of friendship? What is the purpose of beer drinking? What are beer goggles? What are professional ethics? Mr. McLeod has plumbed those in a mere eleven paragraphs. Which is why I've simply quoted the pith of his essay for January 2016's The Session: Beer Blogging Friday, rather than contributing myself. Beer is joy juice, Mr. McLeod says. With more of that, may the goddess bless us all in 2016, every one. Bonus Pic(k) of the Week: 2015 retrospective. For New Year's Day, I'll navel-gaze a bit (a virtual 'selfie,' if you're not familiar with the phrase). The camera with which, more often than not, I take my photographs is an Olympus Pen E-PL1; when without that, it's my phone's camera. Should I be saying 'digital image' rather than photo(graph)? In 2015, I recorded over three thousand images. Here's a recapitulation of the fifty-two I chose to be a Pic(k) of the Week. Clicking on any of the thumbnails will get you to the image and its story. Today, Friday, I wish you, my readers, a merry New Year's Day, and a prosperous, happy, and healthy rest of the year. Tomorrow, Saturday, the 2016 edition of Pic(k) of the Week begins anew. Thanks for stopping by.